R.I.P. Roger Lee What a great guy Strong and Silent, however all powerful in a gently way. Nothing endears so much a friend as sorrow for his death. The pleasure of his company has not so powerful an influence. True friends are the ones who never leave your heart, even if they leave your life for a while. Even after years apart, you pick up with them right where you left off, and even if they die they're never dead in your heart. A true gentleman and will be forever missed Our thoughts go to his family and friends to which he had many. I know that we will not find someone like you again, so happy, so motivating, in good times and in bad times always you were drawing a smile and were there to support us, we will always remember you. 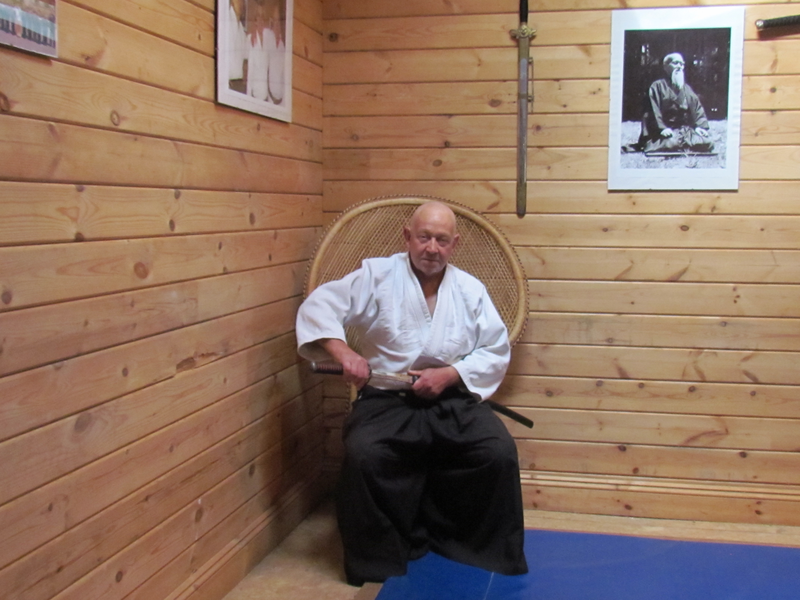 The world has lost FANTASTIC Bob Aikido master and our thoughts go to his family to who he was so very much loved. Congratulations to Adrian Young, Alan Srbljanin and Roger Lee on receiving their 4th Dans and Pete Magee on receiving his 3rd Dan on 15th November 2015. Big Congratulations to Peter Magee following his recent successful grading for the rank of 2nd dan. The grade was awarded following a grading that lasted over 2 sessions to make sure that all the necessary elements for a 2nd dan grading were covered. 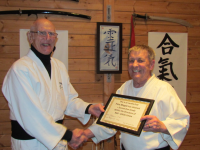 The grading was conducted by Master Bob Marsay, 6th dan who was very pleased to award Peter with his grade. Peter is presently 72 years old and a fantastic example of how Aikido can be practised with increasing ability well into later life. 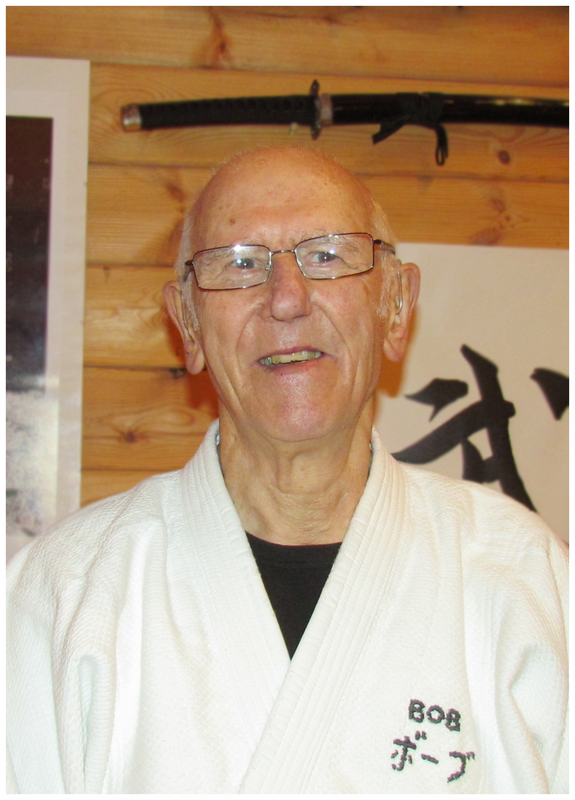 Many Happy returns of the day to Master Robert Marsay (6th dan) upon the occasion of his 79th birthday. 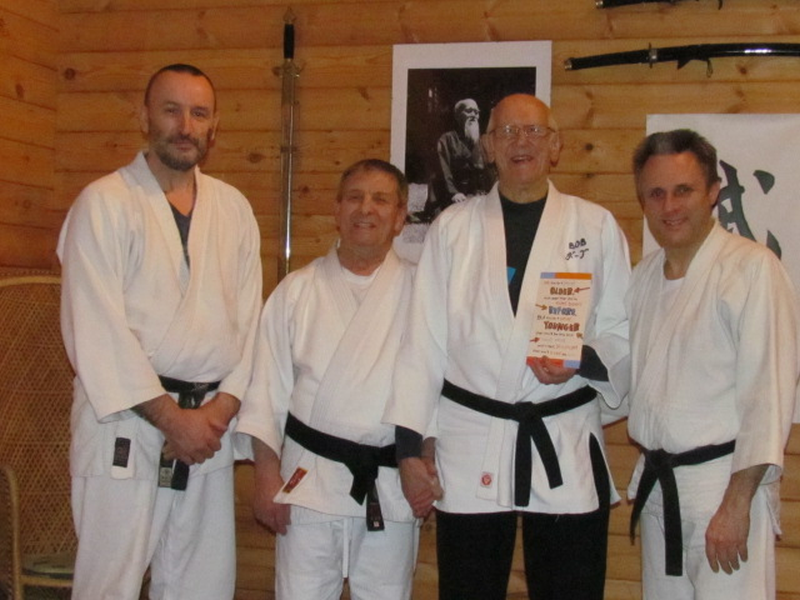 Bob's birthday is on the 20th February so at the following days Aikido session he was photographed receiving his Birthday card signed by his fellow instructors and students at White Wings Dojo. Bob has been training in Aikido now for 43 years, most of which time was spent as a student of Master Patrick Stratford (8th dan). He has also recently begun training in Iaido and Jodo following a short break from his Aikido practice following heart surgery proving the old adage that where there is a will there is a way and Still loving life and happy throwing the youngsters around the Dojo . Happy Birthday Bob from everyone at White Wings and we hope there will be many more to come. 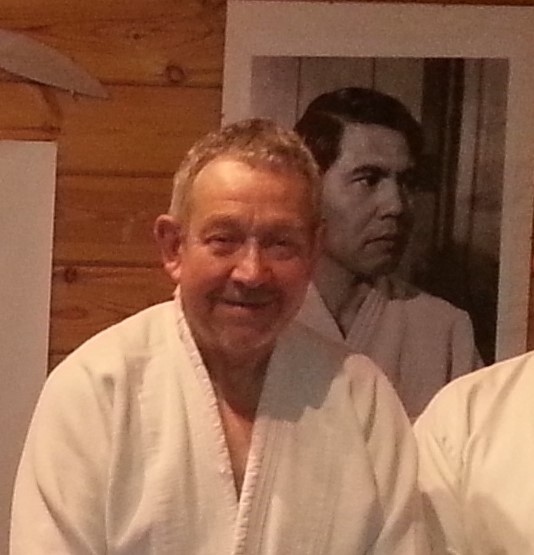 Master Pat Stratford, Honorary President and Chief Technical Advisor of the Aikido Union England, sadly announced that he would be retiring from active teaching on the tatami due to on-going knee problems and strict medical advice. 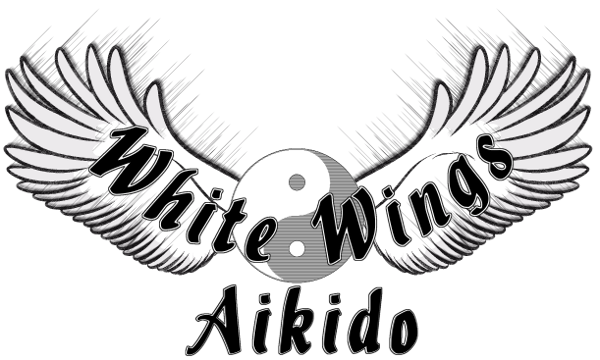 He maintains his weekly presence at the dojo to give Technical Advice to the Instructors and will continue to attend each Aikido Course at Coventry as long as he is able to do so. We look forward to his guidance continuing from the side lines and Sensei John Gaynor 6th dan taking over the Instruction on the tatami at the monthly Coventry courses. Sensei John Gaynor was awarded the rank of Rokudan (6th Dan) on the 7th November 2010 at Coventry, England, UK, by Master Pat Stratford Honorary President and technical advisor of the Aikido Union England at the end of a monthly Aikido course. 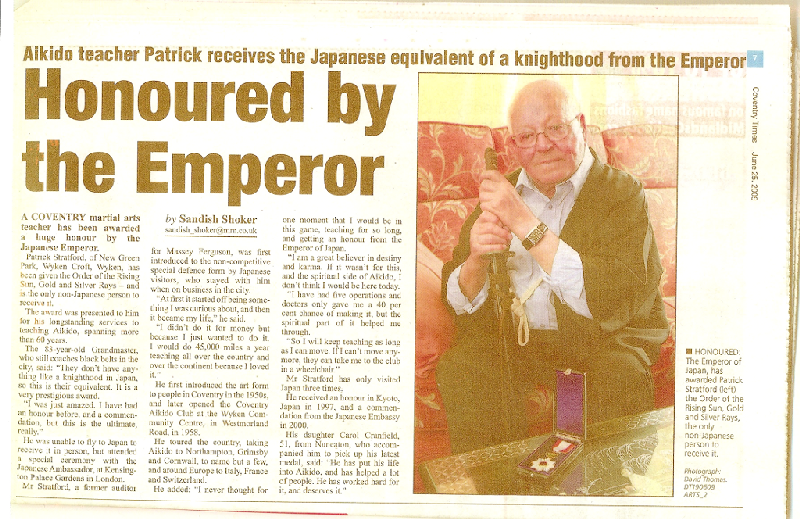 The rank was awarded for his achievements in Aikido and his continuing work to uphold the values of the Aikido Union England as President, and to spread the learning of Aikido and Japanese tradition throughout the UK. Order of the Rising Sun On 26th May 2009, H.E. Ambassador Ebihara bestowed the Order of the Rising Sun, Gold and Silver Rays upon Mr Patrick Walter Stratford for his outstanding contribution to the promotion of aikido in the UK. The bestowal took place at the Ambassador’s residence. Since 1960 when Mr. Stratford founded and became the president of the Aikido Union England (AUE) in Coventry, the AUE has provided aikido instruction to many people throughout the UK, both men and women, young and old. Among the highlights of the AUE achievements was the performance in the presence of Crown Prince Naruhito and the Prince of Wales in May 2001 on the occasion of the JAPAN 2001 festival. The AUE also served as a focal point for interaction with the Japanese aikido community. In his speech, Ambassador Ebihara stated that aikido is not merely a sport but part of a Japanese tradition which attaches great importance to spiritual values. Mr. Stratford’s promotion of aikido in the UK has contributed greatly to the understanding of traditional Japanese culture. Upon receiving his decoration, Mr Stratford stated that it was a great honour to receive the decoration and extended his deep gratitude to Mr Norio Tao and Mr. Shigeho Tanaka of Meiji Jingu Shiseikan Dojo, both Japanese masters of aikido.